When Raed Jadallah rode the waves of the Mediterranean sea on his surfboard, he was able to transcend the limitations placed on his life forced upon him, as he is a Palestinian living in the besieged Gaza Strip. During some stolen moments of time, the 26-year-old surfer would leave strife behind on Gaza’s shore. “When I surfed, I forgot about everything,” he said. “It is like you are in another city where there is no war or blockade. All you think about is how you will catch another wave,” Jadallah said. Jadallah’s passion came to an abrupt end when he was shot on 6 April as he participated – albeit as a spectator – in the second Friday of the Great Return March protests that kicked off on 30 March along the eastern border fence separating Israel from Gaza. The demonstrations call for an end to the 11-year Israeli-led blockade on Gaza and for Palestinian refugees’ right of return to the lands their families were forced to flee during the establishment of the state of Israel in 1948. A bullet struck Jadallah in his left thigh as he stood about 150 metres away from the fence. He now depends on crutches to walk. “I did not participate in the protests. I was just watching the protesters burn tyres and throw rocks when I was suddenly shot in my thigh,” Jadallah, from the al-Shati refugee camp of western Gaza city, recalled. Tensions have soared in Gaza since 30 March, when Israel met largely peaceful mass protests with lethal force, killing at least 171 Palestinians, including medics and children. One Israeli soldier has been killed. According to Ashraf al-Qedra, a spokesperson for Gaza’s health ministry, of the nearly 18,000 Palestinians who have sustained injuries since the Great Return March protests began, over 5,000 were injured in their lower limbs – including athletes who suffered from permanent and long-term disabilities. 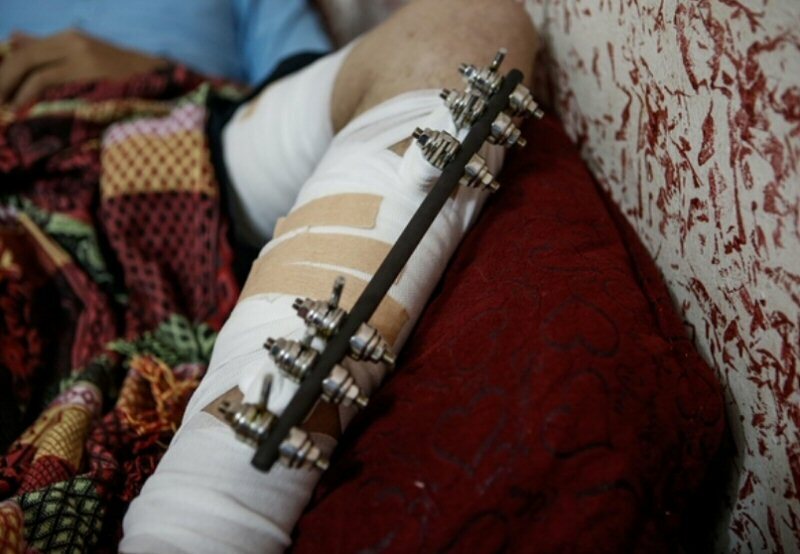 Jadallah says the Israeli snipers targeted the protesters’ lower limbs to prevent them from walking again. Rights groups have said that Israel is carrying out a policy of deliberately targeting largely peaceful protesters with live fire and using “excessive and lethal force”. In April, Amnesty International documented witness testimonies and evidence that it said proved Israeli forces were killing and maiming peaceful demonstrators who didn’t pose any imminent threat to them. Jadallah started surfing when he was only nine years old. With his house located near the beach on the nothern coast of Gaza, he found refuge in the Mediterranean sea. “Surfing was not just a hobby that I practised during my free time. It was rather something I lived for, the only thing that gave me a reason to wake up in the morning,” Jadallah told Middle East Eye. Soon after, he started participating in local competitions organised by local surfers where he would sometimes win the top prize. Although he still had “a long way to go,” Jadallah said he had been training intensely in order to compete in the International Surf Festival next year. “If I were at work and knew the sea was high, I would take leave and ignore everything only to go surfing,” Jadallah, who works in construction, said. After he was shot, he immediately began dreading the possibility that he would never be able to surf again. The bullet caused severe damage to his bones and muscles. According to Jadallah, he is supposed to be treated abroad, but his case is pending referral by the Palestinian Ministry of Health. It has been postponed due to the large number of urgent cases awaiting medical treatment outside Gaza. “My life has completely stopped. I have been waiting for the past five months to travel for treatment, but there is an overwhelming number of urgent cases that need exit permits,” he said. Jadallah said his doctor told him he needs bone grafting in order to be able to walk again. The doctor estimates that surfing will have to be put on hold for at least the next few years until he fully recovers after the surgery. “What would you do if the only thing that gave you life was taken away from you? I do not care about my injury, I will recover sooner or later … but will I be able to surf again?” he said. In 2001, Jadallah lost his younger brother, who was 15 at the time, when he was killed in protests during the second Palestinian Intifada with a bullet to his chest. His older brother, 31, was injured in 2006 by Israeli forces during an Israeli attack on the Gaza Strip when a bullet struck his back. He has been confined to a wheelchair ever since. Due to these tragedies, Jadallah is the main breadwinner in his family of 13, and they all live under one roof in a 140-sqm home. He has been unable to continue working in construction because of his injury, leaving his family with no source of income. Jadallah started working as a fisherman at the age of 10 to help provide for his family. Under the Israeli naval blockade, which has been in place since 2007, Gaza fishermen can only venture out six to nine nautical miles (11-17km) from shore. Within this distance, the water is contaminated with raw sewage. Fishermen are often attacked and killed by the Israeli navy, as they struggle to make ends meet. Ahmed Abumarahil dreamt of becoming a professional boxer. Before he was injured during the Great Return March protests, the 21-year-old used to train for hours non-stop each day, swinging at punching bags filled with cloth and sawdust due to the lack of resources. Abumarahil, who started boxing at the age of 16, fell in love with the sport after walking by a boxing club in his neighbourhood where a local championship was being held. Abumarahil would not take no for an answer. He gathered eight of his friends and neighbours to register in the new training course with him. In the next five years, Abumarahil practised boxing diligently. He was supposed to compete in the Arab Youth Boxing Championship as a member of Palestine’s national boxing team in March 2017, but he could not travel due to the Rafah border being closed at the time. Abumarahil was injured in three separate incidents during the Great Return March protests. The first time was on 6 April, when he was hit in the abdomen with “a rubber-coated steel bullet”. “I was trying to help an injured young man, but I ended up lying on the ground beside him,” Abumarahil said. One month later, on 4 May, Abumarahil suffered from severe burns on his hand after he held a tear gas canister and tried to toss it away from a group of girls near the fence, but the canister stuck to his hand and wouldn’t budge, according to Abumarahil. But this didn’t discourage him from joining the protests the week after. The third injury, which took place on 8 June, was the one that caused his temporary disability. He was hit with a bullet in the right thigh, and about four seconds later another bullet struck him in his left leg. Doctors say he will not be able to walk again unless he undergoes surgery abroad, and Abumarahil is still waiting for a Turkish hospital’s response to a referral for treatment. Abumarahil, who currently uses a wheelchair, says he would do anything to recover and practise the sport of boxing again. Abdulhamid Fayyad, 25, started playing volleyball at the age of 12. By using a rope hanging between two buildings in an alley as a net, Fayyad and his friends used to play for hours on end. He then started playing at school and on the beach before enrolling in local sports clubs and participating in local competitions, where he led his team, al-Shati, to win several times. Before he was injured on 14 May, Fayyad dreamed of representing Palestine in the FIVB Volleyball Men’s World Championship and the Volleyball Nations League one day. He is one of the few lucky ones who still has a day job, as a hairdresser in his uncle’s barber shop in the al-Shati refugee camp, even after his injury. Fayyad says he was trying to carry an injured man to safety near the border fence when a bullet penetrated his leg, causing severe damage to his bones and muscles. Doctors estimate that his leg will need at least three years to fully recover, and Fayyad doubts whether he will be able to play volleyball again. Fayyad immediately underwent surgery. Doctors inserted a platinum rod in his left leg to repair the severe damage that was caused by the bullet.